I got an email today from 37 Signals today about their forthcoming CRM tool called Highrise (formerly known as Sunrise). Curious to see where the project was at, I went and snooped around, trying out some common beta URLs to see if I could get a sneak peak… (naughty naughty) and, finding nothing, it dawned on me that Jason Fried was probably using his standard domain prefix for his account… just as he’s done with the Backpack reviews. Sure enough, there was a welcome page at jf.highrisehq.com but what else did I discover? None other than a link to “Login with OpenID”. I tried logging in and it went through all the proper steps — so it does look like this is a functioning feature. So it appears that the 37 Signals guys have finally drunk the Koolaid and will be supporting OpenID… I asked for this awhile ago but now, with DHH on the case and writing code, it seems that it’s actually going to happen. And I couldn’t be more excited about it. 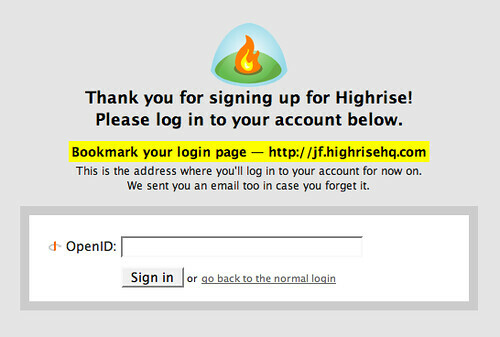 Finally, one login for all my Basecamps, Backpacks, Campfires, Tada Lists… and now, Highrise. This is exactly the way it’s supposed to work. Super sneaky of you to find that, but I’m glad you did. I was already looking forward to Highrise with immense anticipation, but now that I know they’re supporting OpenID, I’m even more excited. I’ve been anxiously awaiting Highrise…This is great news! Really wonderful news. I am so excited and expecting the grand opening. Awesome news, great work 37Signals. Now if only we Google would support OpenID to solve their identity crisis. Nice find! I guess I need to learn about this OpenID stuff, seems to be all the rage lately – maybe we’ll have to integrate it into Tick.